To package granular food products without vacuuming, the most ideal solution is a vertical packaging machine that hermetically seals the product, guaranteeing a hygienic, quick and precise result. All these features are found in X-BAG EVO, a packaging machine that is ideal for all companies that package manually and want to speed up the bag forming and closing process. Let’s see how this machine works. Form: the first step of the machine is to create a package from a flat heat shrink film, which is first sealed on two sides in order to create an easily fillable bag. The third side – at the bottom – is already closed by the fold of the film. Fill: at this point, only the upper part remains open and is used to fill the bag: the operator must only pour the product into the hole provided at the top of the machine. However, this procedure can also be automated by inserting the machine in the line. Seal: once the bag is filled, X-BAG EVO seals the upper part of the bag and conveys it out of the machine. The bag is ready to be sold. Rapid format change: an innovative adapter enables X-BAG EVO to change the packaging format in just a few seconds. This reduces machine downtimes. Maximum versatility of materials: X-BAG EVO can package granular products in all flat film types: polyolefin, polyethylene, micro-perforated and macro-perforated, biodegradable films and cartene. 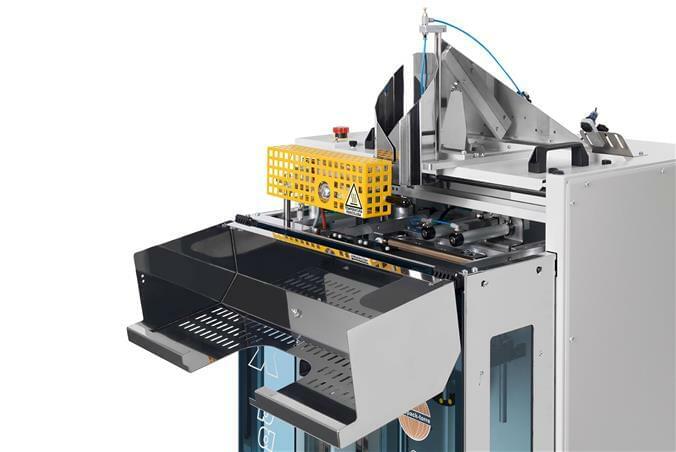 Economic compactness and accessibility: X-BAG EVO is an extremely compact packaging machine that can be easily placed in rooms of any size, even small ones. Furthermore, the competitive price-quality ratio also makes it accessible to small businesses. High-quality materials: steel sheets for the structure and Plexiglas for the front glass, whereas the forming pipe is made of AISI 304 steel, a stainless steel alloy that guarantees maximum hygiene when packaging granular food products. And many more advantages that you can discover on the product’s page. Do you want more information regarding this packaging machine? Contact us for any request, no obligation!